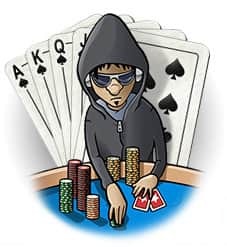 The loose aggressive poker player or the “LAG” is one of the most feared types of poker players and for the most part they are winning poker players. You will get all different types of LAG’s, both good and bad. In the following article I am to talk about typical characteristics of a LAG, there strengths, weaknesses and how to profit from them. 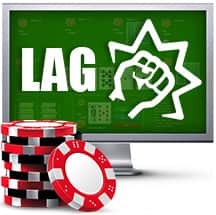 Before we carry on, I want to tell you that the majority of your profits when playing poker will not come from LAG players, LAG’s are usually the winners in poker, so much of my advice will be about how to minimize there edge against you or how to profit slightly from some of the weaknesses in there game. 3-bet percentage: Typically above 7%. Aggression factor: Typically 3 or above. Continuation bet: Typically high. Coincidentally, good lags seem to c-bet less. Hand reading ability: Typically good but not always. Overall style: Plays lots of hands, understands equity, bets aggressively. 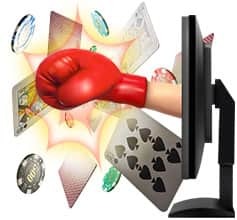 The biggest strengths of loose aggressive player is that they are aware of how important the initiative is and they find lots of spots to bet and take down the pot with a weak holding. Typically, good LAG’s usually have a high w. I like to call them the kings of maneuvering because they seem to be in all the pots but manage to stay out of trouble when they face resistance on there travels. LAG’s are typically aware of there image and will get a lot more action than tight players or nits. The reason for this is simple, the more hands they play, the more weak hands they will play, the less likely they will have a strong hand. LAG’s will get paid off often when they have a strong hand and there bluffs will get called down light. Good LAG’s will typically have balanced ranges and will make sure that when they barrel off in certain spots, your call will not be super profitable. The biggest weakness of the LAG is how many hands they play, they play too many hands and will bet too much. Bluff raise them more often. In order to combat the lag, its best to play a TAG style, with a tight image. What you do is look for spots where your range can perceived to be strong and there range is likely to be weak, then you add in some bluffs into your range. So for example, in spots where you will frequently only have strong made hands or draws, you can introduce raises with much weaker hands as a bluff. These hands could be hands like bare overcards, overcards with backdoor draws or overcards with gutshot draws. What this does is allow you to capitalise on your opponents excessive aggression in spots where your range is still fairly strong overall, your opponent may think your making moves but there’s nothing they can do about it due to the strength of your overall range. Its also worth noting, that when you bluff raise you will still likely have some equity, so if you have two overcards you could have 6 outs to the best hand when called. This is more than enough to make your play profitable against there wide betting range. Typically when your raise is called on the flop, you may want to follow up with multiple barrels. Sometimes you wont want to, much of that is based on your assumption of how light they will call your raise and the turn card. Only you can make these assumptions, this will be based on both there tendencies and there opinion of you. For the most part, I talk a lot about slowplaying being bad and that fast playing is the best way to capitalise on your opponents mistakes. However, its pretty much the opposite story against loose and aggressive players. LAG’s will barrel very frequently so you will want to let them make this mistake against you when you hold a strong hand. Usually I would recommend never slowplaying a set on a draw heavy board, but against a LAG this might even be the best line (Depending on how aggressive they are). You see, LAG’s are often good hand readers and will assume that when you call twice on a flush draw board or a straight draw board, you can never have a strong hand like two pair or a set because you would have raised earlier. This may give them an excuse to either value bet thin or go for the 3 barrel bluff. You need to keep your strong made hands in your calling down range so that they can make this error against you. Another benefit of doing this is it also protects your medium strength calling range. As soon as your opponent sees you call down 3 streets with a set, when he would assume you would raise the flop, he will automatically assume that’s in your range in the future and he will be inclined not to 3-barrel bluff you as much and play much more transparently against you. Preflop slowplay and 4-bet bluff. The preflop slowplay is something I love to do against LAG’s. 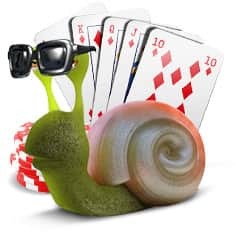 Typically LAG’s will 3-bet with a very wide range, in order to combat this you can introduce both preflop slowplaying with monster hands and preflop 4-bet bluffing. Whenever my opponents 3-bet range is closer to 10% than 5% im often inclined to slowplay a hand like AA and KK preflop. Because there range is so wide, they are less likely to have a strong hand, so will fold often to a 4-bet. Therefore, against these players, slowplaying your strong hands becomes super profitable and so does 4-betting as a bluff to get them to fold whatever hand they 3-bet with. 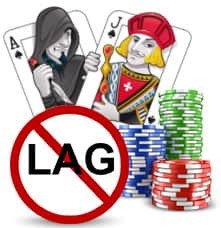 LAG’s are generally winning players and you wont make much money from them in the long run. There understanding of ranges and equity is what precisely makes them a winning player. But that being said, there biggest weakness is that when they bet, they hardly ever have a strong hand. So in order to beat them you have to counter this by letting them bluff when you have a strong hand or taking them off there hand by raising when you hold nothing. Remember, having a tight image is crucial to getting away with some of these plays. Use them at your own risk!